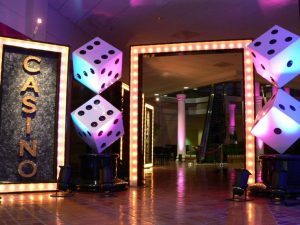 The decorations and supplies for a casino themed party are important for getting the right atmosphere. 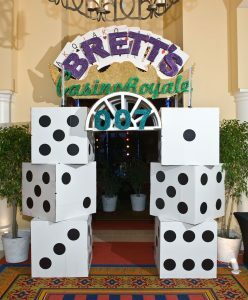 There are many different casino styles you could go for that would inform your casino party decorations. Before choosing decorations, decide on a theme more specific than ‘casino’. Is it a European 007 style casino, a Vegas or Atlantic City style casino, or do you want to just go all out with red white and black? You could also go Western with a Texas Hold ‘Em Poker night. The choice is yours, but find a theme that is cohesive and that your guests will enjoy. Decide on a venue first too, so that you can have it in mind while thinking of casino decorations. Make it a party your guests are glad they left their houses and their online casino sites for! When it comes to casino parties, your games themselves are part of the casino decorations. You want professional looking tables where guests can feel like high rollers. If you can hire real casino tables, that’s great, but you can also get creative with printed tarpaulins or green felt to cover normal tables. You can use a white marker to draw Blackjack, Craps and Baccarat lines on the felt. Make sure you have enough sets of cards, dice and enough chips per person (at least 35). You may be playing for real money, but chips give an authentic casino feeling anyway. Think about what games you want to offer and whether you’ll need extra equipment for them, such as a roulette wheel. Once you know what your games tables will look like, the rest of the casino theme decorations can flow from there. When it comes to casino party decorations, try not to leave anything out. Many party supply stores, online and in person, sell relatively cheap casino theme decorations like trays, cups, serviettes, balloons, centerpieces and signs. But you can also do all your casino decorations DIY so that it’s extra creative and unique. Make buntings out of fake money or cards, or brush up your origami skills and make party favour boxes shapes like dice. Maybe decorate your doors like playing cards, with paper cutouts. String up twinkly lights, or neon ones for a Vegas feel. For a very classy casino atmosphere, hang up red velvet curtains or make a mini red carpet down your corridor. Playing cards and chips decorations are fun, but perhaps you want to be a little more creative with your casino party decorations. There are so many different things you can do with a casino party! You could make your theme The Great Gatsby, and put up 1920s art deco casino decorations and get your guests to dress up. You could go for an underground mafia poker night feeling, or turn your venue into a Wild West Saloon for a Texas Hold ‘Em. Or, go full 007 with spy decorations and lots of martinis. The opportunities are endless. It’s a nice idea try to incorporate the food you serve into your casino theme decorations. Make it all red, white and black, or simply make it look like something that would really be in a casino. It is more important for your whole party to be cohesive than having the fanciest or most realistic decorations.